‘If you get charged, don’t run. And try not to point!’ – key advice from our gorilla guides. I succeeded at the not running part (just barely) when I got bluff-charged by a male gorilla, but the ‘not pointing’ part was next to impossible. In fact, it’s the first thing I did when I saw several dark figures squatted among the bamboo brush in Volcanoes National Park, Rwanda. ‘Oh my god there they are! !,’ I exclaimed – without even thinking – my hand raised, index finger stretched out. Luckily, there is a reason they say ‘try’ not to point. The guides know how hard it is, and it’s more of a precaution to prevent the critically endangered mountain gorillas from interpreting an out-stretched hand as an offering of food – if they happen to notice. 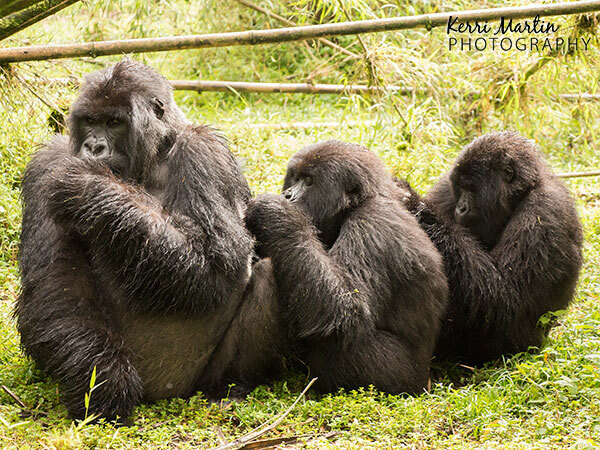 Our group of 13 gorillas, known as the Umubano troupe, did not seem to notice my gesture. In fact, they barely acknowledged our presence – they just kept on being gorillas. After my initial ‘involuntary point prompting’ glimpse, we made our way closer to the group. The dark figures transformed into full-fledged gorillas. My first sight of a handsome gorilla face framed by the bamboo caused another involuntary action. I hastily raised my camera and snapped away, worried the vision would disappear before I could capture it. This response was a by-product of my Canadian wildlife photography mentality – knowing your subject could be gone in a flash. It turns out my hasty shooting was completely unnecessary. 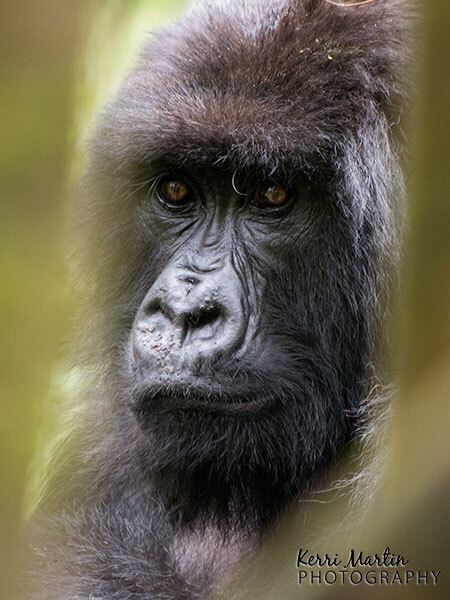 For a full hour, we quietly observed the Umubana troupe, at times standing within 7 meters of the gorillas. I was amazed at how gentle and calm they were as they sat in the grass, relaxing, eating, grooming each other, etc. Like any wild animal, they have the potential to be dangerous if they feel threatened (hence the advice to not run), but gorillas are naturally peaceful, and incredibly fascinating to watch. Their ‘human-like’ qualities are a big part of the allure of these majestic creatures. As I watched the Umubana group interact, the depth of their bond to each other was obvious. No doubt these gorillas make up a big, beautiful family, nurturing one another and connecting ways which many humans would envy. 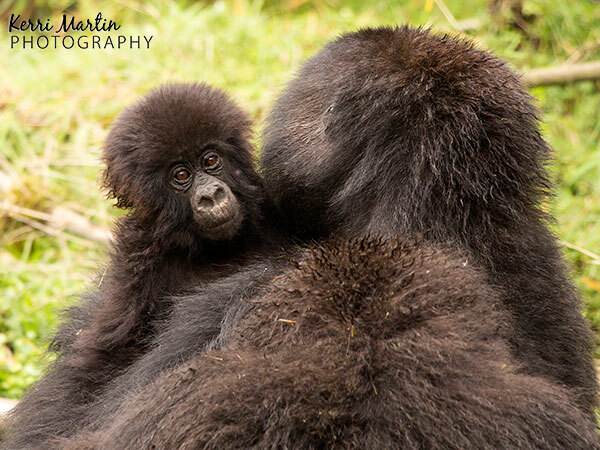 The group consisted of two silverbacks (mature males), a few younger adult males (black backs), some immature/young gorillas, a small baby and a few mature females. Male gorillas develop the silver backs after the age of 12, indicating the most mature/leaders of the group. We discovered it is not unusual for there to be two silverbacks per troupe. 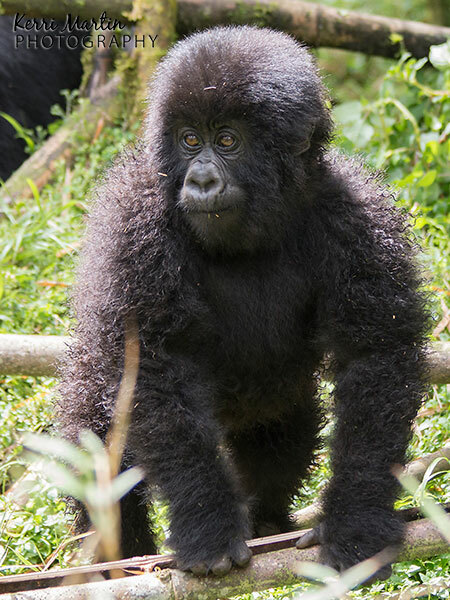 In the Umubana troupe, one of the silverbacks had been away for a few weeks and had just returned that morning. 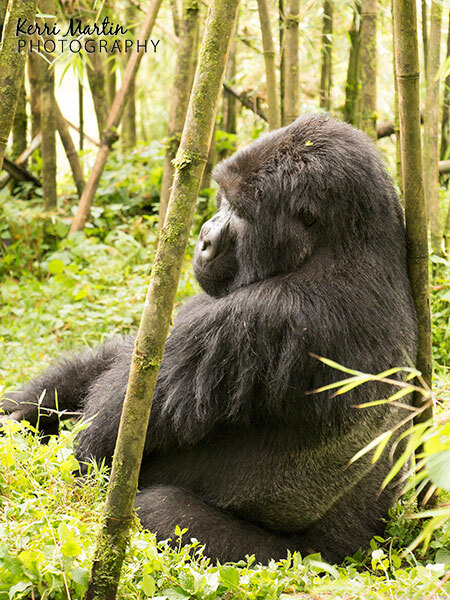 In his absence, the other Silverback would have been leader, but lost his position when the more dominate male returned. Having been demoted, he looked sad and dejected as he sat against a tree with his head down. Watching the mother with the baby attend to her child was so touching. She cradled him in her arms and never let him out of her sight. There were two other youngsters that I imagine were in more of the ‘toddler’ phase of development. They somersaulted through the grass (literally somersaulted! ), climbed the trees, swung from the branches, and strutted around with a confidence only the young can display. Our timing with the group could not have been better. With the exception of the active young ones, they were in rest mode. The dominant silverback seemed to know when our time was up. He got up and walked away, the rest of the group followed closely behind. 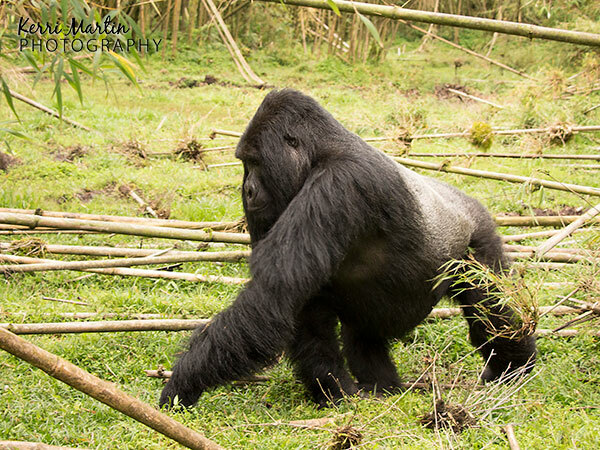 The last to leave was the dejected, second silverback – it seemed to take him the longest to muster the energy to get up, but when he did, we got a nice view of his massive figure ambling through the forest. Volcanoes National Park is home to a number of gorilla troupes that are frequently visited by tourists. They are part of an estimated 880 individuals left in the world. 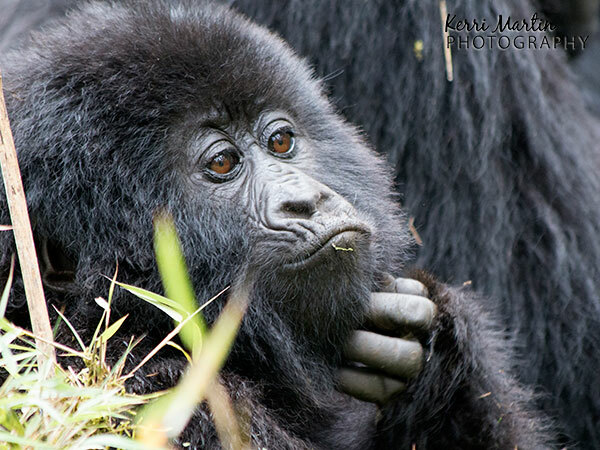 Mountain gorillas are only found in three countries: Rwanda, the bordering Democratic Republic of Congo and Uganda. All three counties are working to preserve and grow the population of mountain gorillas, as described through the International Gorilla Conservation Programme . Dr. Dian Fossey, subject of the popular 80s movie Gorillas in the Mist, was a pioneer in mountain gorilla conservation. Her legacy is still a powerful force for the protection of the gorillas through the Dian Fossey Gorilla Fund International. 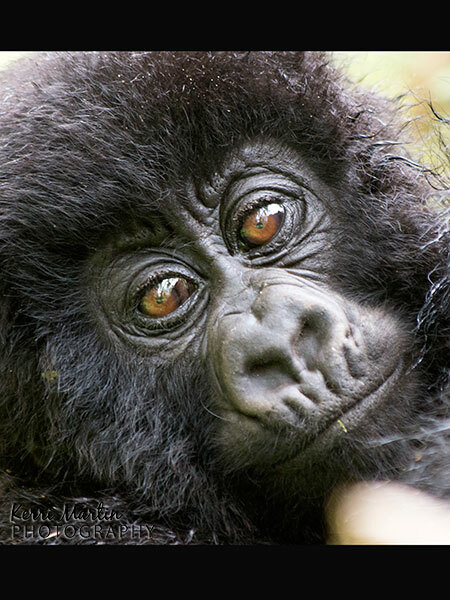 Thanks to the efforts of such conservation organizations, local community members, the Rwanda government, trackers and guides, and many more, the population of mountain gorillas is growing. Tourists pay $750 US each for a permit to see the gorillas, and a portion of these funds go directly towards the conservation of the animals and preserving the surrounding communities. There is a one-hour time limit and all visitors are advised on how to behave around the animals, keeping human impact to a minimum. Gorillas share 98% of the same DNA as humans, but do not have the same immune defenses. So people with potentially infectious illnesses are not permitted to visit the gorillas. Even a simple cold for a human can be a serious health risk for a gorilla. And it’s so true! For the 8 visitors, who all paid 750$, we had two gorilla guides, three military people to protect us in the park, several trackers who found the gorillas that morning, and most of us paid a personal porter to help us on the hike. Many of the trackers/porters are actually former poachers who have discovered they can make a living through preservation and appreciation vs. killing. I love that! And this could be a whole other blog post, but I have to end by saying how much I love Rwanda as a whole. Before my trip to Africa, I had a few people say to me, ‘oh Rwanda, that’s a scary place!’ And indeed, it was a very scary place about 20 years ago in the midst of a genocide that killed 500,000 to 1 million of its residents. Now, it is the cleanest country I have ever been to (including Canada) with progressive politicians focused on gender equality and citizens that exude a sense of pride for their community. Amazing post! The photos are stunning! What an experience…. WOW. Thank you Kerri for sharing your experience with us. Your pictures are amazing and your words are inspirational. That is a truly inspirational post. I love it when travel dollars go to make a difference in the world! You got us thinking about sharing DNA with other species and we found out that we share 50% of our DNA with bananas and with other humans 99.5% (on average). Fascinating. Thanks for the post and the pictures! Excellent post Kerri and such great imagery to help document this wonderful experience. Hope we’ll see more “Africa” posts in the weeks to come.